Central Intelligence Agency (CIA) on of the most active and dynamic intelligence setups in the world needs massive amount of money to carry on its clandestine operations all over the world. It has happened when CIA used local sources to conduct a coups, assassinations, regime change, etc. As U.S. has a long history to support democracy by hook and crook until and unless a dictator is ready to serve U.S. interests to prolong its rule. Operations like the one completed in Iran in 1953 to remove Prime Minister Mussadaq and backing Shah’s regime by using assets in civil society, or in Iraq in 1975 to arm Iraqi Kurds to destabilize Pre-Saddam Iraq or more recently using its assets in Pakistan to pave the way of direct U.S. intervention in Pakistan under pretext of hunting Al-Qaeda. It is not only CIA anymore in trade for using it as gold mine to finance its illegal operations all over the world but U.S. economy also need some liquidity in its banks, it doesn’t matter if it is coming by drug trade. Left: Demand and trafficking of drugs globally. U.S. is one of very high concentration drug trafficking territory thanks to Regan’s National Security Council who turned a blind eye towards South American cocaine socking into U.S. in 1980 when CIA was backing all the drug traffickers of Contra movements in Nicaragua. This business enriches not only the United States-friendly Afghan warlords but also elements of the Northern Alliance, the U.S. key ally in the country. More disturbing is fact that this money also contributes in CIA’s operations against Pakistan as well. In Asia demand for heroin is more than any other drug but it is not the case world over. Cocaine is favourite drug which is consumed the most. Cocaine was nothing new in South American countries but it was only during Nicaraguan contra movements against the then dictator it got shoot up. It was again CIA’s regime change operation to bring “democracy” in Nicaragua. It was during this period when the whole region saw an unprecedented surge in cocaine trafficking in 1980. This has been investigated none other than but by CIA’s inspector general in later years. Answer is not only CIA was aiding these cocaine traffickers and money-launderers but Ronald Reagon’s National Security Council also turned a blind eye towards these drug trades despite the fact that later these very drug traffickers brought cocaine to mainland U.S.. According to CIA’s inspector general report, published in online magazine The Consortium magazine, Oct. 15, 1998, it was Reagan’s National Security Council which cleared proven drug traffickers and CIA inspector general Frederick Hitz confirmed long standing allegations of cocaine traffickers. The NSC’s covert airline was the main transportation mean to do this trade in safest possible way. Figure 1: Armed men of Nicaragua insurgency during 1980s, armed with CIA weapons bought with drug money. Profit gained by these drugs was main driving force behind all this trade and with heroin it was much more than what it was with cocaine. Ironically U.S. and Europe became biggest markets of heroin prepared produced in Afghanistan. Regan’s administration is also a common factor in both Afghan heroin trade and contra cocaine traffickers. Role of CIA in first Afghan war was not overt as it could provoke Russians in more direct retaliation albeit Cuban missile crisis of 1960s. To avoid that kind of hostility it was more suitable for CIA to have silent links with Afghan warlords and providing sources to grow poppy. “By the end of Russian invasion in 1989 Afghanistan was second largest opium production spot with 1350 Metric ton after notorious Golden Triangle including countries like Laos, Thailand, Burma and Vietnam which was producing 2645 Metric ton at that time leaving Latin America way behind with just 112 Metric ton”, as per U.S. Drug Enforcement Administration. In 1994 unrest and lawlessness in Afghanistan gave rise to Taliban. Motivated with their strict religious background and education they put ban on all kinds of drugs in territory under their control but this was not the cure for chronically infected Afghan economy and society. Non availability of any job market and strong hold of Northern Alliance of Northern part of country remained biggest challenge to these efforts to cut down poppy cultivation in Afghanistan. But despite all the challenges Talibans were able to put a serious cut on opium production in Afghanistan by start of 2001 when they were about to capture Northern Alliance’s strong hold Mazar-e-Sharif but post 9/11 scenario not only changed the geopolitical dynamics of the whole world but also destroyed the efforts of Taliban to control opium production. Left: In year 2001, just before U.S./NATO invasion into Afghanistan, Taliban were able to cut down opium production by a decisive margin. This was also one of core reasons against Taliban along with other excuses. After year 2002, when Taliban were removed from power there is a historical increase in opium production in Afghanistan, money is going to pentagon to carry on Afghan and Iraq war despite a historical recession in U.S..
Afghanistan is leading opium production in world today but after the invasion of U.S. in 2002 Afghanistan is also attributed to have largest heroin production in the world as well. Without active support of Pentagon and CIA it is not possible to export drug prepared with more than 8000 metric tons of opium. U.S. relations with Northern Alliance in Afghanistan after Taliban have given a free license to drug producers, traffickers. CIA and Pentagon both have their links to all these criminals in order to get supplies of the drugs and export it in U.S. Army planes. It has been reported that CIA used U.S. Army planes leaving Afghanistan carrying coffins which were filled with drugs instead of bodies. To make sure undisturbed trade U.S. appointed all Northern Alliance drug lords at key posts in Afghanistan and most prominent appointment was none other than President Hamid Karzai. Karzai’s brother, head of Kandahar’s provincial council is proven drug trafficker facilitating the transportation of heroin from Kandahar eastward through Helmand and out across the Iranian border. Left: Ahmed Wali Karzai, appointed by his brother, President Hamid Karzai, to represent Kandahar province in Kabul. According to media reports he is main player in exporting heroin and opium to European countries through Turkmenistan. 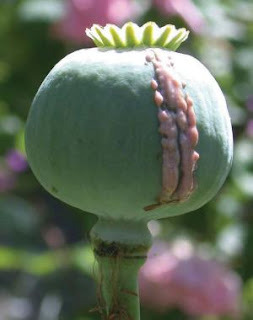 Provinces like Kunar, Pektika,Paktya has low poppy cultivation and other provinces where all U.S./CIA supported warlords are holding key positions are growing most of opium crop. It was only after U.S. invasion there was a 4400% increase in opium production. Almost the whole world is affected by this drug trade but countries which lie in routes of drug traffickers are worst effected after the original drug markets. Countries like Pakistan are paying a very high price for U.S./CIA drug trade as there is a constant increase in drug addiction in Pakistan. Iran is another country which happens to be in route of international drug traffickers so it is also facing problem of smuggling of heroin and morphine from Afghanistan and Pakistan to Turkey and Europe. After U.S. invasion of Afghanistan this route has become active manifold then it was previously. Another disastrous effect it brought to Pakistan and Afghanistan other neighbors is serious law and order situation in bordering area of each country with Afghanistan. Combating this evil trade is not possible until a holistic effort is made by international community in this regards but its chances are bleak as this trade is needed by global imperialism (Israel, U.S., UK) more than ever before to give some support to their dying economies. Afghanistan became leader in opium production and main hub for providing heroin and its main ingredient to whole world. All this happened under the control of champion of human rights U.S. and its intelligence setup mainly CIA. Situation is becoming more and bleaker unless Pakistan, China, Russia, Iran and Afghanistan governments start thinking about this trade and its far reaching affects on U.S. economy and CIA’s funding. It is time when the whole region should become equivocal against this trade and ask U.S. to leave the region for greater good of the billions of people in region. http://yort.fr/ Was ich haben in beobachtet Bezug auf Computersystem Speicher immer, dass gibt es Anforderungen wie SDRAM, DDR oder irgendetwas anderes , dass Muss fit in der Anforderungen der Hauptplatine. Wenn das Motherboard Computer vernünftigerweise aktuellen während es nicht os Fragen, Verbesserung die Speicherplatz buchstäblich normal erfordert unter Stunde . Es ist unter der Liste einfachste PC aktualisieren Prozesse eine vorstellen können . Vielen Dank für Angabe Ihre Ideen.